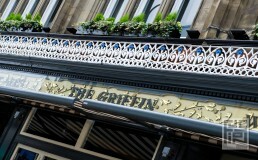 The site of The Griffin occupies the ground floor within the former Griffin Hotel on Boar Lane in Leeds City centre. The Griffin was built in 1872 as a luxury hotel for the wealthy railway travelers of the time and was given grade II listed status in 1975. The client, Spirit Pub Company, originally wanted to create an individual bar establishment that would fit into the local bar scene around the Boar Lane area. 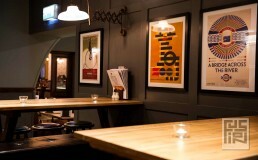 However, within our research it was noticed that traditional and real ale operators were being overlooked and so the decision was made to carry out the refurbishment in a traditional style using their Taylor Walker brand, an established brand mainly based in the south, popular with Londoners and tourists alike. It would become the first ‘new build’ Taylor Walker site outside of London and therefore a big leap forward for its operator with the risk that it might not be accepted into Leeds, an area with its own strong history and relationships with breweries. The site had undergone extensive refurbishment over the years meaning many of the original details and ornamentation had been removed. However we were not deterred, from the offset we decided the design should showcase the space with the reintroduction of traditional details alongside contemporary ones. The final design incorporates antique mirrors, classic deep buttoned fixed seating with brass detailing, mixes of hard and soft floor finishes. The seating styles are mixed throughout with poseur heights sitting alongside comfortable wing back style armchairs. The main design challenge was the second pre-requisite of creating a modern twist that will appeal to a younger clientele, whilst not veering too far away from the roots of the building. It was decided to create an easily accessible but almost separate space with a unique style within the rear cavernous space of the site. Far away from the newly positioned traditional bar servery, this area was lacking in character so the decision was made to transform it. 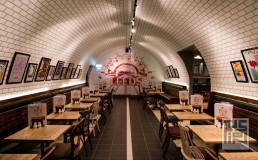 A vaulted seating area with the feeling of being in a London tube station or Victorian railway station waiting room was formed, the surprise and surreal nature was intentional and has become one of the main talking points.